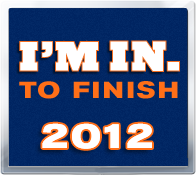 The Miami Marathon was held on Sunday, Jan. 27 and I was happy to be a part of it. 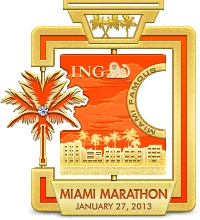 I have been travelling to Miami during the same dates for the past several years and always wanted to run in this event. This year I decided to fly in a couple of days early and take part. I'm not a big fan of races. To me running is a way to relax, unwind and be with my own thoughts. Races are anything but. They're loud, crowded, with rigid start times, course clocks, pre-determined mileages, etc., not exactly relaxing. I don't train for races either. they take too much time and discipline. I just go about my own runs and then just go for the race. Not exactly a winning strategy as I have been unable to break 4 hours, but I have no plans to address that with training. Runners were required to pick up their numbers from the convention center 1 or 2 days prior to the show. I understand that they want people to attend the expo, but that creates a bit of inconvenience for people who must travel to the event. The race started at 6 am with shuttle pickups at 4 am. That's way too early for me but it's probably done to get in front of the heat. Upper 70's was forecast later on the race day. One thing I didn't like about the event was that the half and full marathoners shared the same course for the entire half. That did create a bit of traffic jam with the 25,000 runners in some areas where the streets were narrower. Other marathons separate full and half marathoners in a mile or two after the start and that helps spread out the crowd making the courses less dense. Overall the event was well organized with a decent number of aid stations and entertainment zones, and the course was interesting with good crowd support, and a nice finisher medal to top it off. I even got a banana from a woman handing them out from her own property. Thanks, whoever you were, it was at the perfect time. And if one was inclined, the ocean was near enough for a quick post-race dip. Who can beat that in mid-winter? Last weekend brought the sad news of a young woman dying just short of the finish line of the London marathon. She was running for a good cause - suicide prevention - at had collected about $700 then, now standing at over $1 million with the outpouring of support from people. There are some who have criticized her for exerting herself to that point and many label marathons as a dangerous sport. Yes, marathons could be dangerous and in some cases deadly, so what? Life is dangerous and eventually deadly. As a fellow runner I admire this woman's conviction and her compassion to tie her love of running to a charitable cause. She died doing what she loved and supporting a cause she cared about. That deserves a ton of respect. On one occasion I was overcome with heat just after a run and passed out. When I came to, I thought that this is how I would like to die, doing what I love, not battling advanced age or illness on my death bed. Nothing wrong with the latter, it's just not my preference. I'll be in the upcoming NYC marathon this year, and if anything, this young woman has given me more motivation to keep on running. Local runner wins Gaza Strip's first marathon race - Sports- NBC Sports.